Sugarland TX is home to the Houston Museum of Natural Science at Sugar Land, the fabulous Farmers Market at Imperial, and the historic Imperial Sugar Factory itself. We offer custom designed, hand crafted, and flat out gorgeous stained glass windows and doors to the residents of Sugarland TX. That includes stained glass for the home (entryways, bathrooms, hallways, kitchens, even basements), stained glass for businesses (offices, restaurants or bars, hotels, shops and salons, and any other commercial space) and stained glass for houses of worship including churches of all denominations, chapels, temples, and sanctuaries. 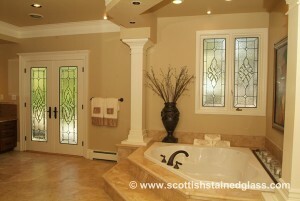 Or custom-design process is the same for residential, commercial, and religious stained glass. It starts with an in home (or in office) design consultation. One of our Houston designers meets with the client to discuss stained glass ideas, show photos, make sketches, measure the space, and work together to create the stained glass that the client will love. As far as styles go, we have many clients in Sugarland TX who love the work of a particular stained glass designer such as Frank Lloyd Wright or Greene and Greene. We can make original window designs inspired by the work of these masters that will add the same look and feel to a room. We also create unique stained glass designs in other styles, including beveled and leaded stained glass, Celtic stained glass, Mission style stained glass, Art Deco and Art Nouveau stained glass, and many others. Our clients customize everything as they like it, from which room to put their stained glass in down to the pattern or design to the colors and types of glass itself. Once the client has finalized the design and approved the sketch, the next step happens back in our Houston studio. We use modern CAD software to create a perfect blueprint of the design, exact down to the millimeter. Then the project is assigned to one of our Houston stained glass artisans, who will build it piece by piece, entirely by hand. For residential stained glass in Sugarland TX, homeowners love to add it to their entryways, their bathrooms (great for adding privacy), their kitchens, their hallways, and many other places. For commercial stained glass in Sugarland TX, we work with owners of restaurants, offices, shops, salons, hotels, bars, and more to create windows, doors, ceilings, skylights, lighting fixtures, and much more. Our stained glass adds a unique ambiance that their customers are sure to love. Many churches across the state of Texas have gorgeous stained glass. Adding stained glass to a house of worship is a tradition that stretches back hundreds of years. 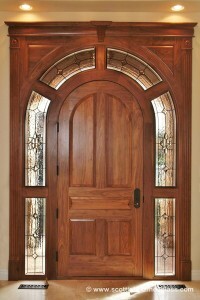 For Sugarland churches who would like to add stained glass windows or doors, we would be honored to work with you. Our designers can create anything you want, from intricately detailed traditional religious artwork to more simple, more modern designs.